James Browning Wyeth (at right) - son of Andrew Wyeth, and grandson of N.C. Wyeth - never outgrew his childhood nickname, "Jamie." And judging from his recent appearance at the MFA to open his retrospective there, "Jamie Wyeth," he never outgrew his fondness for knickers, either. 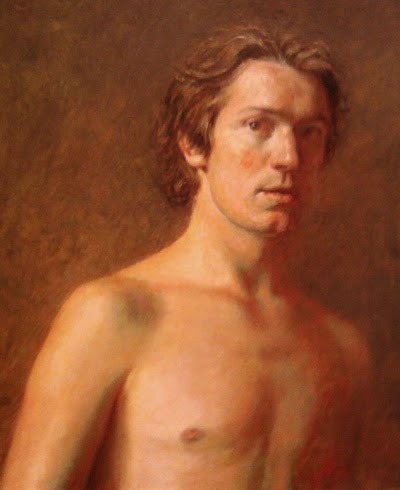 Which suggests there's a touch of Peter Pan to this third-generation scion of our first family of realist painters. Images like the one at right only re-inforce that impression: Wyeth was 23 at the time, but portrayed himself as younger - indeed, as almost adolescent. Diffident, sensitive, and sexually vulnerable, he's like a threatened waif out of Treasure Island or Kidnapped (which his grandfather famously illustrated in a career that kickstarted a dynasty). What the painting also suggests - beyond a haunting theme of innocence lost amidst barbarism - is that the young Wyeth was one of the very greatest American portraitists. No less an eminence than Lincoln Kirstein declared him the best since Sargent, so it's no surprise there's a painting of Kirstein himself at the MFA that more than validates that claim - even though it's one of Wyeth's lesser achievements in the genre. Indeed, it's outshone by a half-dozen portraits that could rank among the most penetrating of the past century. 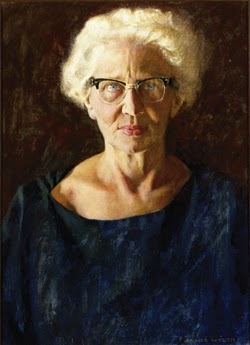 Wyeth's notorious rendering of the eminent cardiologist Dr. Helen Taussig is here, for instance (at left) - an image so stark it shocked the good doctor and her colleagues at the time, perhaps in part because it had been painted by a 17-year-old boy (it was the young Wyeth's first commission - he only got it because there's wasn't enough cash available to cover his father's fee, to whom it had first been offered). Although to be honest, "horrified" might be a better word for the official reaction to the portrait. The indefatigable Taussig had been refused a degree by both Harvard Medical School and Boston University, but finally was awarded an MD by Johns Hopkins, where she took up residency. 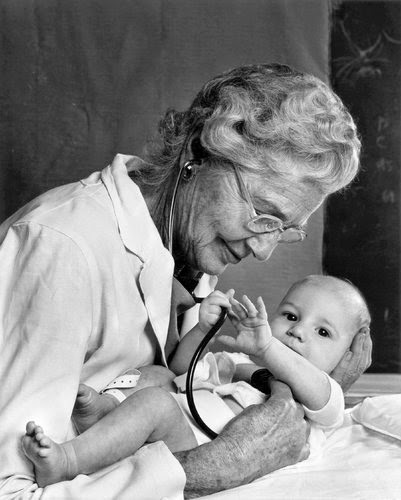 During her tenure there, she suggested a technique that saved the lives of countless "blue" babies, and eventually became chief of cardiology. Thus her colleagues hoped to honor her with a standard slab of "great man" flattery - much like the many canvases that gather dust in the halls of hospitals the world over. But instead they got this piercing picture of troubled, but undaunted, intelligence - biographers have since confirmed that Dr. Taussig had just lost a patient prior to sitting for it, and Wyeth captured that inner blow almost exactly. It should also be mentioned that at this point in her career Dr. Taussig had gone deaf - yes, she "listened" for the heartbeats of the babies in her care with her fingers. Somehow I was unsurprised to learn that; Wyeth's artistry had already painted in an unspoken backstory for her of repeated gauntlets and obstacles overcome. But that's not why the doctor who unveiled it wept in dismay (somehow she could not see the calm fire in the sparkling sapphires of the portrait's eyes). Her colleagues likewise called it "evil," and the hospital blanched at hanging it - so it was offered to the great physician as a gift. She in turn was gracious to Wyeth, but wouldn't hang the picture; for years it gathered dust in her attic instead of her office. Not everyone was so shocked by Wyeth's round, unvarnished rendering - in fact The Lancet judged it "a brilliant masterpiece" - but it still remained under wraps for the coming decades. Friends and colleagues even urged Taussig to destroy it (a more conventional compliment was eventually procured from celebrity photographer Yousuf Karsh, at right). Still, somehow the painting survived in the archives at Johns Hopkins, and slowly became better-known, although its MFA appearance marks the first time it has been widely seen since the day it was unveiled. Which may be why curator Elliot Bostwick Davis holds it back till the last minute as a kind of artistic lagniappe - although to be honest, perhaps she also senses in its depths some of the richness that only the first half of "Jamie Wyeth" consistently supplies. For this retrospective does seem to wander far from the power of such images as "Portrait of Shorty," below, another early triumph for this precocious painter (who completed this at age 17 as well, along with another masterpiece not at the MFA, the heartbreaking "Lester", which is worthy of Velázquez). But if determination was the subtext of "Taussig," then irresolution shadows "Shorty," although Wyeth explores this very different theme with even deeper and more patient craft (indeed it would be hard to overstate the subtlety of this portrayal). 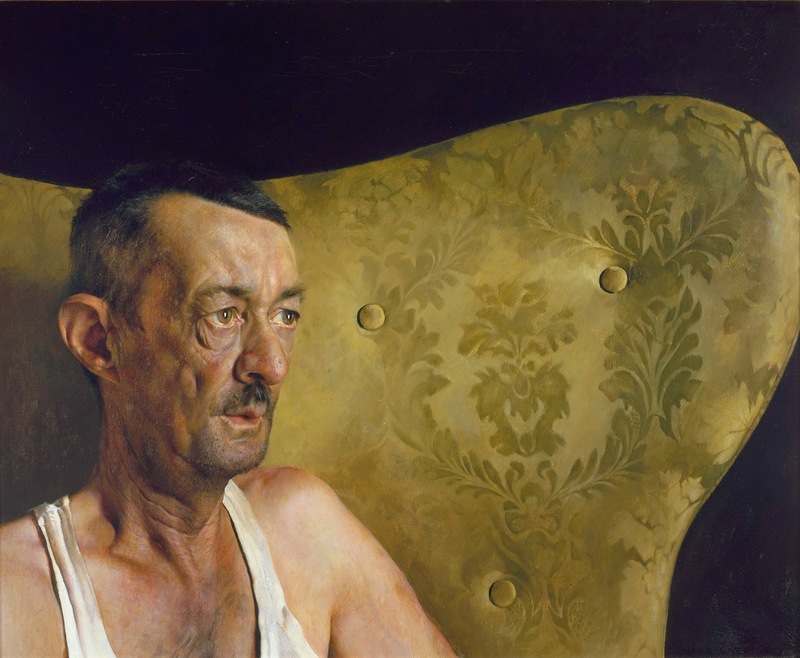 The subject was a local "character" in Wyeth's hometown, and the young artist suggests his lowly status with calm economy: Shorty is unshaven, and clad only in a "wife-beater," although his physique is slack, and skin sagging; meanwhile the smoothly upholstered throne in which Wyeth has placed him seems to comment ironically on both his tattered clothes and sallow complexion, while whispering of a richness he has never known (and never will know - "Shorty," we realize, will always come up short). In fact, if you squint a bit, you may even see something like scornful laughter in the Rohrschach blots of the wingback's satin pattern. But beyond the chair itself, there is only blackness - a void which Shorty himself seems to both emanate from and scan with anxious uncertainty. Indeed, his haggard eyes are the most touching thing in the picture: they seem to anticipate some new humiliation from the universe. It's yet another startling achievement from a basically teen-aged painter. But you may have noticed that every work discussed so far was executed before the artist's 25th birthday; and indeed "Jamie Wyeth" leaves one quite sure that the artist's early years were his heyday. Still ensconced in the supportive frame of his family, and couched in their artistic tradition, he was operating at a level that was almost vertiginously high, and yet - by the critical standards of the day - also ridiculously low. For Wyeth endured repeated critical drubbings throughout the 60's, just as he should have been coming into his own. 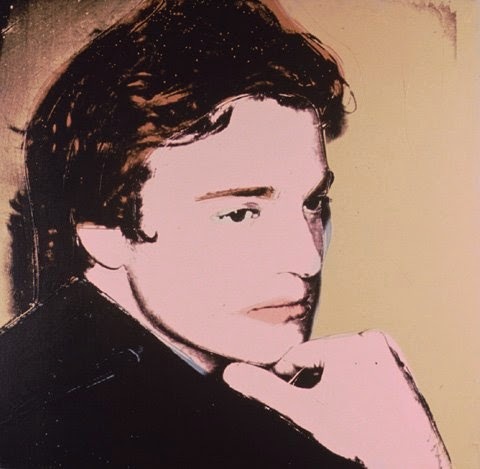 So perhaps it's no surprise that he was drawn into the orbit of Andy Warhol, the rising critical darling of the era (Warhol's silkscreen of Wyeth, at right). But we'll consider that encounter, and its fall-out, in the next installment of this critical assessment.